America's spiritual slide has been happening for decades. Each succeeding generation has seen more and more people who identify themselves as "nones." "Nones" are people who say they have no religious affiliation. The latest findings from Barna reveal that Gen Z is continuing this downward spiral. (Gen Z is today's kids - born between 1999 and 2015). Gen Z is the first truly "Post-Christian" generation. More than any previous generation, Gen Z does not associate with any religious identity. The percentage of Gen Z that identifies as atheist is double that of the adult population. The percentage of Gen Z kids who say they are atheist is 13%. This is compared to 6% of all adults. What is causing the next generation to turn to atheism? Surveys among Gen Z reveals the big reasons. 29% - I have a hard time believing that a good God would allow so much evil and suffering in the world. 23% - Christians are hypocrites. 20% - I believe science refutes the Bible. 19% - I don't believe in fairy tales. 15% - There are too many injustices in the history of Christianity. 12% - I used to go to church, but it's just not that important anymore. 6% - I had a bad experience at church or with a Christian. Did you see the last few stats I listed? We are failing the next generation. While Gen Z kids want to know why they should trust a God whose world is ravaged by war, violence, injustice, natural disasters, pain and suffering, we are giving them cute, Christianese responses that aren't sufficient. Our cute lessons won't enable kids' faith to survive the science class in their freshman year of college. Our cute lessons won't empower kids to be a difference maker in their workplace one day. Our cute lessons won't give kids the answers they need to the hard questions they are pondering. Our cute lessons won't help them live for God in a world that says He doesn't exist. Walk kids through the hard questions now. We must be proactive and help them find the right answers before they hear the wrong answers. A great place to start is with the Pranksters series, where kids face the hard questions about the Bible and find out why we believe it is true. Move beyond just having kids memorize verses to helping them understanding what the verses really mean. It would be better to have kids memorize and understand 1 verse than to have them rapidly memorize 10 verses that they do not understand. Not be afraid of letting science and the Bible intersect. We must show kids how the Bible is backed up by science. And if there appears to be a variance, how the Bible is true and reliable. Behind the stats, are kids in your community and mine, in your church and mine, in your family and mine, who are in the process of deciding what they believe. Kids who want to know if the Bible can be trusted. Kids who are questioning if science and faith can be compatible. Kids who are trying to figure out who Jesus is and why they should follow Him. Kids who are looking for answers to the hard faith questions. 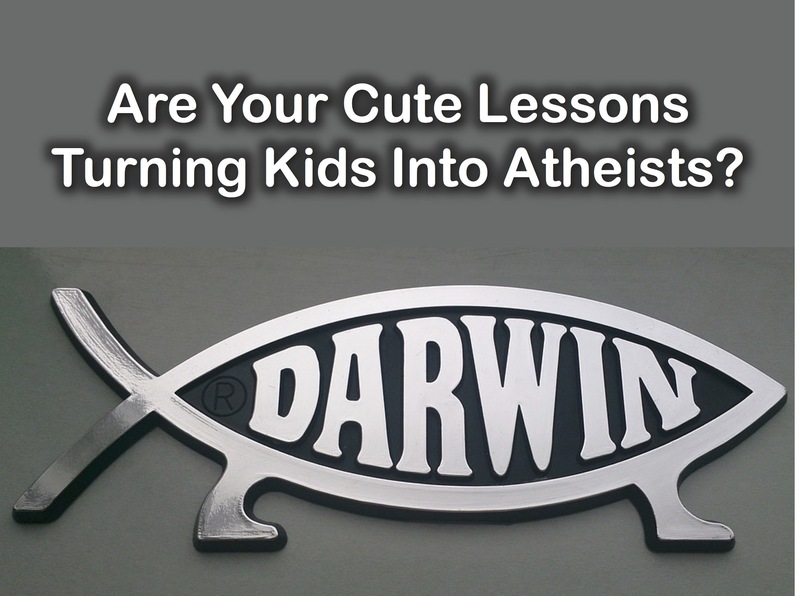 Are our cute lessons turning kids into atheists? May this be a wake-up call for all of us. This is good stuff, Dale. Thanks. I'm behind you 100%. I believe all of this and it breaks my heart, especially regarding the kids in my ministry. I've been walking alongside one kid for 4 years. He hasn't seen his dad in that long. How can a kid believe in a heavenly Father when he can't trust his own earthly dad? I believe those of us in ministry can fill the void and narrow the gap but it won't be with large children's areas and cutesy lessons. Thanks for this post Dale. How much of this is where families are at culturally? When they attend an average 1.5 times a month, discipleship is challenging. Also, I am a firm believer in equipping in resourcing parents to take a lead role spiritually, but many parents faith in our current church culture is shallow. I love the teaching ideas and concepts you've listed, but their is a real challenge of how often engagement happens. Are you experiencing this? Any solutions that have had success? Great questions Craig. I think it takes both. Teaching at home and church. I think the challenge you mentioned is real. If parents have a shallow faith, that's what they will pass onto their children. Kids don't drive themselves to church. If they are coming once a month it's because of wrong priorities of parents. I share some solutions in today's post about how to see parents come to church more often. Thanks for being part of the conversation. Where are the stats from? Was it from a study? Thanks TJ. Praying God's blessings upon your ministry today. As our friend, Jim Wideman says, “You can’t feed kids jello and tell them it’s meatloaf.” Kids need meat to grow spiritually healthy too. We need to recognize that physical maturity has nothing to do with spiritual maturity. Dear Lord, help us to have a vision to take kids deeper into true discipleship. I have seen first hand what happens when churches don’t want to discuss the hard questions. There are 2000 years of tradition and history where loads of questions were asked answered and yet all that has been ignored. I could not ask questions in church because asking led to people thinking you were losing your faith and that led to punishment. Sermons don’t discuss the hard parts of faith and clergy don’t go to Sunday school class and take questions. Thanks for sharing your thoughts Mark. Praying we will change that for the next generation. There is an apostasy happening in the world, unfortunately. As for parents, I teach children's church and VBS. One way I have tried with some success is that when the children do come I try to impress the lesson on them with questions afterwards, and praises. AND then I tell them to go home, to NOT forget, and make sure they tell mommy &/or daddy ALL ABOUT THE LESSON they learned that day, and put the craft where everyone can see it and comment about how great a job they did on it. It has brought a few back to church, but it's a starting point. Hopes it helps. Very great word, brother. Our people have to know God, not know ABOUT him. The encouragement we have, if we believe who God says he is and believe that he will do what he says he will do, is that he is pouring his spirit out on his people right now all around us. With the kids and families that are understanding exactly what you have posted here, I am personally seeing a fresh fire and a desire to live close to God. I'm seeing marriages reconciled, people finding freedom and moral compasses being re-calibrated. The irrefutable law God has created concerning light and darkness is this: when the darkness gets darker, the brightness of the light becomes more irresistible and blinding because light ALWAYS WINS. I see these stats and are encouraged because this new generation that has no identity with religion-- when they do intersect with the Truth (the real Jesus) these kids aren't coming with religious baggage or preconceived notions about church. So ,the good news is there is nothing HINDERING them from interacting with the Truth honestly. I see great opportunity here. We will probably continue to see exodus from churches (small "c") but I'm excited because that means that the Church (big "C") is going to get stronger and healthier, leaner and meaner (for the kingdom, lol). I say, "Hold on because the Church is poised for God to do some awesome stuff in our kids and families!" I'm praying that the Church would have a hunger and thirst for Truth, righteousness and His presence. Just wondering, were children born between 2010-2015 asked to answer these research questions or did their parents answer for them? That's a great questions. The research I looked at didn't clarify that. I thing the majority of answers came from the top age side of Gen Z.